After two costly, disastrous, and emotionally draining attempts to rebuild the classic 62ft motor yacht Tiky, I was seriously considering scuttling her. This was 2009, and I had been throwing good money after bad since buying her three years previously. With no end in sight, it seemed like the only sensible option. Five years later, on a glorious, balmy July evening, we motored regally into the bustling Vieux Port de St Tropez on a totally rebuilt and gleaming Tiky – it had been a long and arduous journey for Tiky as well as for me and my family, and it was an exciting and deeply emotional moment. The old girl had already enjoyed an interesting life. 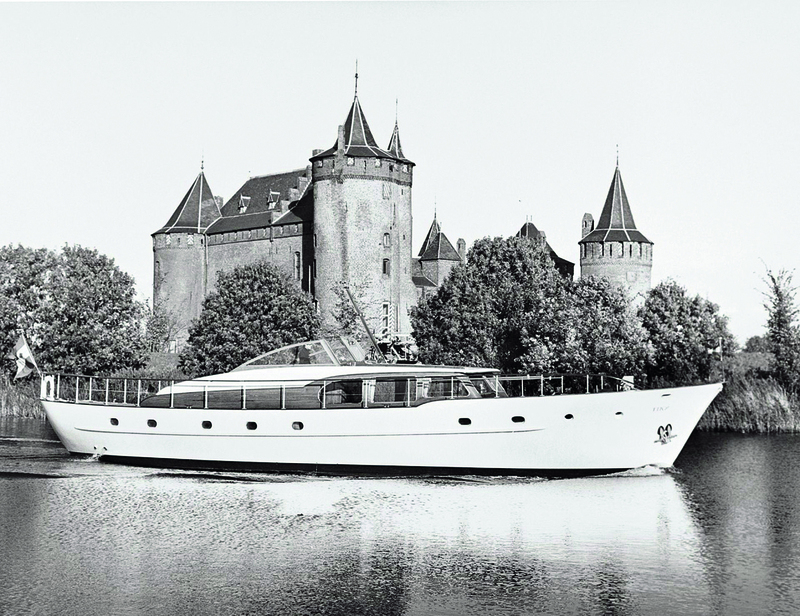 Commissioned in 1960 from Van Lent & Zoonen, one of the original members of the Feadship consortium of Dutch boatyards, by a prosperous local family, she was a large and expensive yacht in her day, costing the equivalent of £1.8 million in today’s money. The Fischers owned Tiky for over 20 years and cruised her all over northern Europe before selling her back to Jan van Lent, the owner of the yard, in 1982 for use as his personal yacht. A few years later she was sold on and renamed Lenten Rose, spending the next 25 years cruising the Mediterranean under various British owners, including Lord Normanton, chairman of the British Powerboat Racing Club, who changed her name again to Alto Volante after his famous race boat. A number of other changes were also made to her during this time, including the addition of Vosper stabilisers, air-conditioning, two ugly foredeck cranes, and a large shed-like pilothouse on the previously open bridge deck. Over the years I have owned and restored a number of classic wooden sailing yachts but in 2007 I was boat-less, having just sold the lovely 55ft 1938 Fred Shepherd yawl Amokura, which I had spent five years rebuilding at the International Boatbuilding Training College in Suffolk. Unfortunately, my three young sons hated sailing boats – “too wet, too uncomfortable” – so I decided to look for a vintage motor yacht project to restore and use as a comfortable family yacht instead. After looking at many options I eventually came across Tiky in Pollença, Mallorca. Externally, she appeared in a tidy cosmetic condition but she was obviously in need of a refit and despite the ugly pilothouse, her tatty interior and a filthy engineroom, there was something about her that beckoned me. Perhaps it was the wonderfully purposeful flare of her bow or maybe her elegant rounded stern, or perhaps I was just enamoured with her Feadship heritage. In any event, although she was being offered for sale at €250,000 the owner was keen to sell and I eventually bought her for €60,000 ‘as found’, expecting to spend another €100,000 or so on a refit. 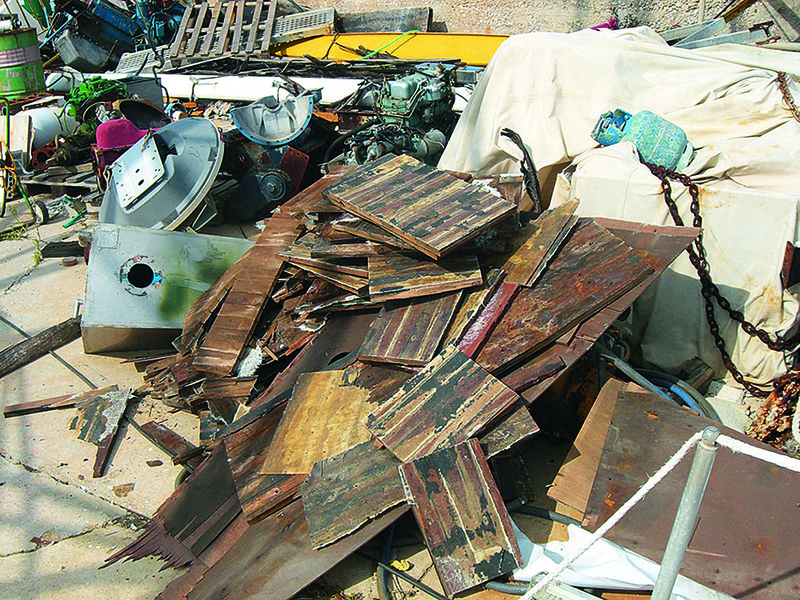 Initially I tried to do the refit at a yard in Mallorca but despite sending over large amounts of money on a monotonously regular basis, progress was painfully slow. The refit rumbled on for a several months, with me making occasional visits, but it just wasn’t working out. 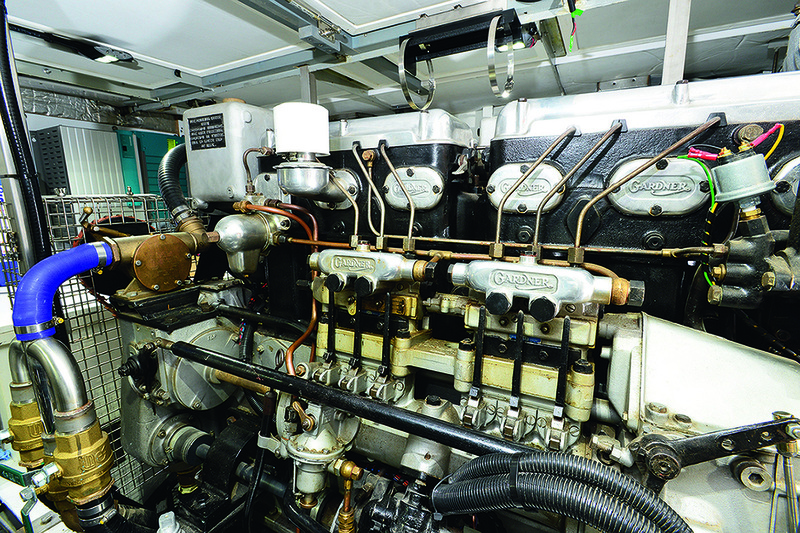 However, we did manage to fit a new teak deck and re-engine her, replacing the worn-out and seized-up MAN engines with two beautifully rebuilt Gardner 6 LXBs supplied and fitted by the excellent Michael Harrison of Gardner Marine Diesels. We had also fitted new stainless steel shafts as well as some basic wiring and pipework, so as soon as she was able to move under her own steam I decided to take her to France to continue with the refit there. A small but well respected firm in the South of France was recommended to me, but doing the refit there proved to be even more difficult and uneconomic. My original €100,000 budget had long been blown and still there was no end in sight. I was getting increasingly stressed by the ongoing problems with Tiky, and repeated enquiries from friends and family asking how the boat was getting on didn’t help. It was at this point that I seriously considered removing the Gardner engines and taking Tiky out to deep water and scuttling her. I actually went so far as to get a quote from a local tug company before discovering that dumping at sea was illegal. But despite all the problems, I still had a lingering affection for the old girl and I decided to have one last try. My yacht surveyor friend Alan Olford, with whom I’d worked on previous projects including Amokura, suggested we bring Tiky back to the UK and prepared a list of UK yards which could undertake a major refit. Unfortunately, they were all either too busy or too expensive. Then Robin Richardson, owner of the small family-run Phoenix Fleet boatyard in Norfolk, who were at the time rebuilding my 26ft 1938 Chris-Craft (see MBY June 2014), suggested E C Landamore of Wroxham. Until a few years ago Landamores was a small traditional boatyard building motor cruisers mainly for the Norfolk Broads hire fleets, but a contract to build Oyster sailing yachts allowed it to move to a much larger premises with staff and facilities to match. 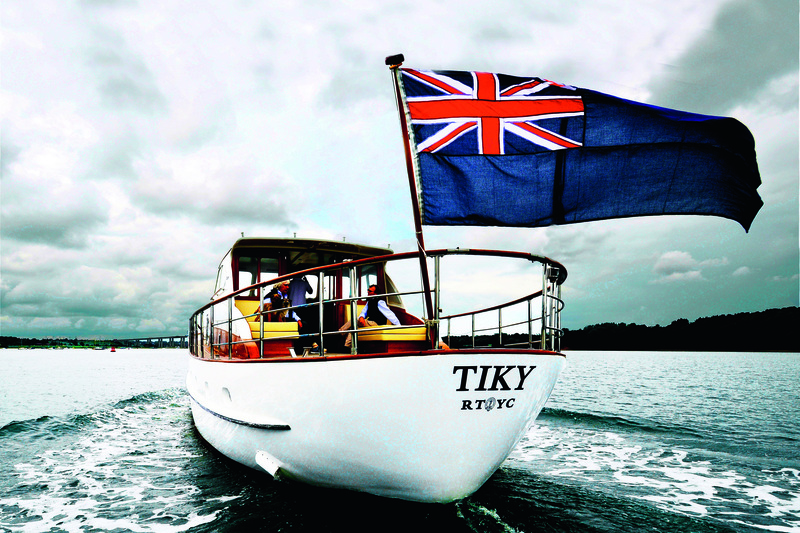 Thankfully the expansion meant it also had spare capacity to take on Tiky, so in August 2009 a delivery crew brought Tiky back to the UK through the inland waterways of France and across the Channel to Ipswich, where she was loaded on to a truck and driven to Landamores. Neither Landamores nor I had any idea what we were in for. Initially, I had only planned to rewire, replumb and rebuild the aft section of the accommodation but it soon became apparent that considerable areas of the steel hull plating had to be replaced, which meant stripping out the entire interior. Years of basic upkeep meant that defunct pumps, fittings, wiring and pipework had all been left in situ instead of being removed, creating hidden water traps. The old decks were rotten, and so had to be replaced entirely. This, combined with leaking decks, meant that the hull had corroded from the inside out, with some of the plating down to 30% of its original thickness. Some of this had been patched up with sections of new plating welded to the outside of the hull. These ‘doublers’ are not only very unsightly but can cause problems of their own by trapping moisture between the layers of new and old steel. Two ultrasonic surveys followed by grit basting of the entire hull revealed the extent of the problem. We took a deep breath and removed the ‘doublers’, cutting back the corroded hull plating till we got to areas where the original steel was at least 90% of its original thickness before letting in sections of new steel. In total, we replaced about 30m2 of steel plating. While the hull was being worked on I set about creating a new interior for Tiky. With all the bulkheads removed for the remedial work on the hull, I had carte blanche to start again from scratch. I decided to change the layout quite significantly, by opening up the galley into the saloon and doing away with a small aft guest cabin in order to enlarge the owner’s cabin and create an ensuite heads. We now have three reasonably-sized sleeping cabins, each with its own head, plus a good-sized galley with a small dinette seating area. My next mission was to replace the ugly 1980s pilothouse with something more suitable. After a morning’s work with a chainsaw, we had reverted Tiky to her original open design. The vast expanse of teak aft deck looked great and I was unsure about whether I should leave her as is or fit another, prettier, pilothouse. After much dithering, I decided to fit a smaller pilothouse that was more in keeping with the rest of her superstructure. I fiddled with numerous designs and even ran a competition with Southampton University’s department of naval architecture, but eventually decided on the very first design that I had drawn up when I first bought Tiky. To keep the feeling of an open boat, the aft windows rise and fall electrically, disappearing into the lockers beneath, and the doors lift off their hinges and stow in recesses under the sunbeds. In fact, if I ever want to revert to the fully open design, the entire pilothouse can be lifted off simply by undoing 16 large retaining bolts. The pilothouse was built in situ using marine ply, strip planking (for the radius edges) and a foam-cored roof, all coated in woven matting and epoxy resin. The solid varnished teak doors are gorgeous and the window opening mechanism, which was built by Anthony Landamore, consists of an electric motor driving a pulley, which lifts the windows using thin spectra rigging rope. Having had such a long gestation period in which to think about the interior, I knew exactly how I wanted her to be. Without any original builder’s drawings to rely on, I measured every area myself and drew everything to scale on paper. I sent my drawings and artist’s impressions to Landamores, who converted them to CAD and returned them to me together with 3D renderings. Following further discussion with my family and the Landamores team (who occasionally had to be reminded that Tiky was a small luxury motor yacht that would only be used in coastal waters, and not a world-cruising sailing boat that would be offshore for weeks at a time), the CAD drawings were amended and signed off by me. These were then programmed into the CNC cutting machine, which produced a series of flatpack furniture kits ready to be installed by their skilled joiners. 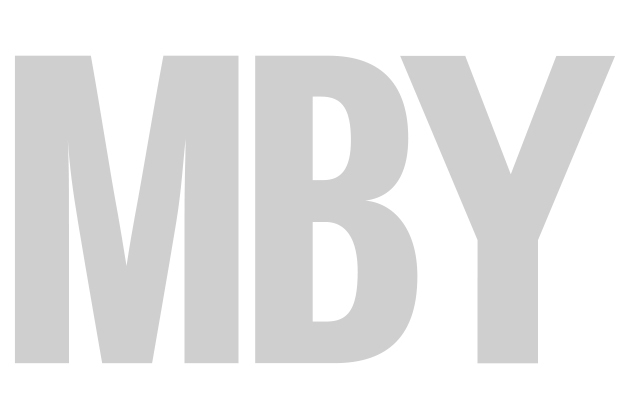 Monthly and often weekly meetings with production director Ron Yaxley and project manager David Russell over the two-year build were invaluable and a very enjoyable part of the process. 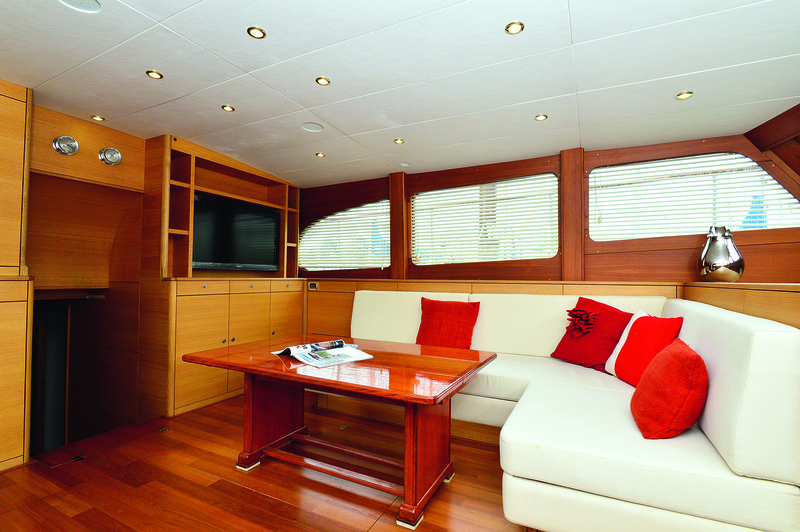 Tiky’s interior was originally a mixture of exotic woods but I elected for a teak cabin sole and light oak cabinetry throughout using horizontal grain instead of the usual vertical, causing much consternation among the more traditionally-minded craftsmen at Landamores. Air-con was added to all the accommodation areas as well as forced air ventilation, domestic lighting and plumbing systems. The galley has a black granite worktop with high-spec equipment including fridge and freezer, dishwasher, washer/dryer and a Gaggenau induction hob. The three heads are all wet rooms with white ceramic worktops and electric loos. A new Wesmar stabiliser system was fitted together with a powerful Sleipner bow thruster. All the mild steel and aluminium deck fittings were replaced in stainless steel, including a new guardrail. 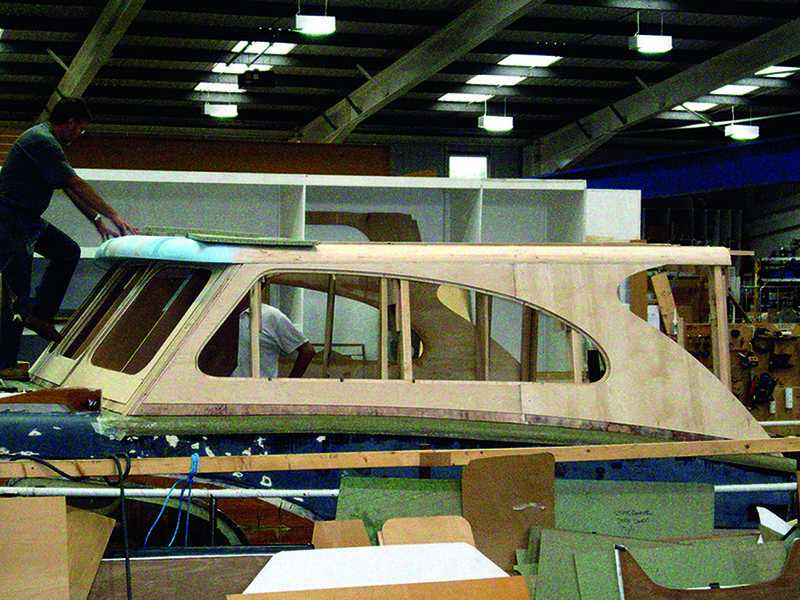 Every single item of equipment aboard Tiky was replaced and in fact, apart from the rebuilt hull and the saloon structure sides (made from wide 25ft-long teak planks) the only elements of Tiky that are original are the saloon coffee table and the Sestrel Major compass, both of which were totally refurbished. I sourced many of the replacement fittings on eBay, including the vintage Strombo triple-trumpet air horns ($150 instead of $3,600) and the Atlas carbon fibre tender davit (£1,200 instead of £8,000). The teak folding Admiral’s side-boarding ladder that I bought along the way and rebuilt is now one of Tiky’s more distinguishing features. The interior saloon is light and airy, with plenty of space. One of the problems we faced was where to site the tender and how to lift it safely. With an elliptical cruiser stern like Tiky’s, hanging a tender from a pair of stern davits was not an option. I wanted to keep the aft deck clear so that only left me the foredeck. The Atlas davit that I bought on eBay can lift 500kg – plenty enough for the small RIB and 20hp outboard that I had in mind. Unfortunately, the steel web structure that was required to support the davit at the gunwale was fitted approximately 450mm further aft than intended, putting the prop very close to the saloon window. I had digital scans and CAD drawings of the tender from the supplier and then worked out the ideal position for the tender to be stowed on the foredeck. However, in practice, not only did the tender not fit where it was supposed to when hanging from the davit but the lifting strops fouled the helm console and the tender didn’t balance when being lifted. After several days of moving the tender around on deck, adjusting the lifting strops, and numerous calls back and forth with the supplier, we eventually realised that neither the centre of gravity nor the lift points that had been fitted were the same as the CAD drawings. We eventually rectified it by moving the lift points on the tender and having a spreader bar made especially to move the lift point of the davit directly over the tender’s true centre of gravity. In December 2011, Tiky (as she is now called, having reverted to her original name) was ready to be moved by road back to Fox’s to be painted, completed and commissioned. There she was grit blasted to remove every vestige of old paint and rust and to key the surface of the new steel prior to painting. Painting an old steel boat is a combination of art and science. Even modern steel hulls built by computer-controlled cutting/welding machines need filling and fairing and Tiky was no exception. After applying several coats of epoxy sealer she had layer upon layer of pink filler applied only to have it all faired back by hand. Then numerous coats of primer and Awlgrip top coats were sprayed on. Fox’s chief painter, Dom, must have had a soft spot for Tiky and often re-painted areas of coatings that seemed fine to me but weren’t acceptable to him. We had a bit of luck when David Russell, the project manager at Landamores, became yard manager at Fox’s. He knew more about Tiky’s rebuild than anyone and his input, advice and dedication to the project was a real bonus. There were however a number of delays at Fox’s, not helped by me being gravely ill in hospital during the spring and summer of 2012, but eventually Tiky was painted and a hundred other jobs done. Finally, in May 2014, she was launched and commissioned. I desperately wanted to use her in the Mediterranean this summer so after somewhat rushed trials on the Orwell, which went fine other than having to replace both aft bearings (they’d seized up on the shafts because of incompatible materials), a delivery crew took her to Southampton, where she was loaded on to a Dutch freighter. Four days later she was off-loaded at Gibraltar, from where she made her way via St Tropez to her new home port in San Remo, Italy. 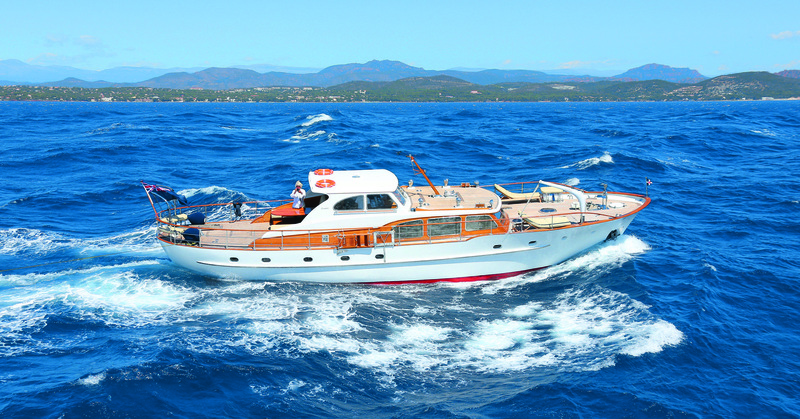 Now, two months on from first arriving in the Mediterranean, Tiky is back in her element cruising back and forth between San Remo and St Tropez, stopping off in beautiful bays and harbours along the way. It hasn’t all been plain sailing though; we’ve had to deal with a number of snags and teething troubles. These have mostly been electrical and easily fixed, but at one point we became so used to something not working that when we lost all electrical power one night, we spent a good 30 minutes trying to locate the source of the problem until we realised the shorepower throughout the entire port had cut out! On the plus side, barely a day goes by without someone stopping on the quay and asking about her. Everyone who comes aboard marvels at how bright and fresh her interior feels for a vintage boat (much to my satisfaction most of them think it is the original) and wonder how a boat that is now over 55 years old can look so good. Most visitors seem to hold special affection for the Gardner engines, as do I, which at their usual cruising revs of 1,250rpm consume approximately 12lph between them. But the real satisfaction for me is seeing my family and friends loving every minute of being aboard this unique, glamorous and now genuinely comfortable classic motor yacht. It was touch and go whether I would kill Tiky or she would kill me, but much like any special relationship you have to go through the ups and downs to build a truly lasting bond and Tiky has certainly been worth the effort. 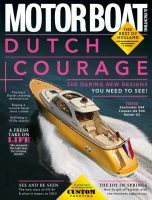 First published in Motor Boat & Yachting, November 2014 issue.